I was diagnosed when I was 4 years old. I was slight at birth, and my aunts both recall thinking there was not enough fat and muscles on my bottom and legs. My early milestones were unremarkable; I was able to sit, crawl, walk, etc. at appropriate ages. As I entered pre-school, it was noted that I fell much more often than the other children, and I had difficulty keeping up with others. I remember having great difficulty remaining upright in a “bouncy house” at a carnival, and also I didn’t enjoy bumper cars because I had difficulty with neck weakness. 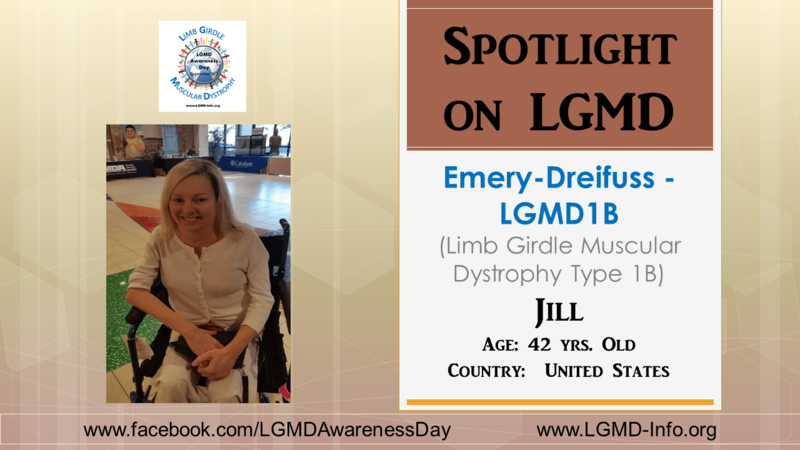 My father and two brothers and one sister all have EDMD, but with a wide variety in severity. One sister is unaffected. It is suspected that my paternal grandmother and great-grandmother also inherited this disorder, but it was so mild they never knew this in their lifetime. I get frustrated because I want to do the things someone my age should be able to do without significant difficulty. For example, keeping up with housework is very challenging, and I don’t end up with the house looking the way I imagine it should after working hard. My greatest accomplishment was uncovering my own diagnosis as a teenager and informing my father’s cardiologist that our genetic disorder required implantation of a pacemaker. Perhaps this saved his life when he was only 44 years of age. It gave us the chance to love him for another 18 years. It made me learn to rely on myself rather than looking to others to solve my problems. I learned quite early in life that if you have a very rare medical condition, you are going to have to become your own advocate. Also, having a muscle disease made me very dedicated to academic pursuits. I studied genetics as an undergraduate, and creative writing in graduate school. Without my achievements in higher education, I might struggle with uncovering my purpose in life. 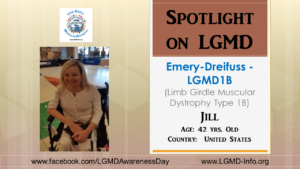 In terms of what I would want people to know about Emery-Dreifuss MD (EDMD), probably I would want people to know I’m just the same as any other person on the inside. I feel the same hurts, have the same dreams, and most of all, just want to be included in all there is to experience in life. I have been happily married for nearly 12 years, and I’ve raised a son to the age of 11, and most of all I would want people to understand that these life goals can be met by a person even if they are unable to walk. I would want to advocate for EDMD to be included in the genetic testing offered to newborns. My greatest wish is that I don’t want a future generation to go through the difficulties I went through, and the best time to intervene is at birth.